World No.1 Magnus Carlsen is not taking any chances in his on-going world chess championship clash against defending champion Viswanathan Anand, according to his father Mr Henrik. The 22-year-old Carlsen has a two-point lead over the five-time champion Anand, with just four games to go. Magnus Carlsen's father Mr Henrik told NDTV: "Carlsen is happy about his preparation so far. We expect Anand to fight back in game 9. Vishy will come out fighting like a tiger. Anything can still happen." Mr Henrik however refused to divulge any details about his son's style of preparation. "He is happy about the two-point lead. But he speaks about things other than chess; he plays cards and listens to music to unwind and to beat the stress," added Mr Henrik. 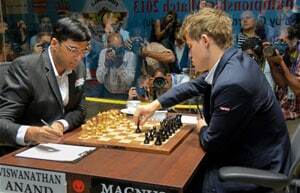 Though the championship clash is taking place in Anand's hometown Chennai, many chess enthusiasts and budding players have praised Carlsen's form and style of play. Aravind Chidambaram, a school student told NDTV: "Carlsen is so strong in the end game, we follow him. He will win the championship this year". Another fan from Mumbai said, " Carlsen is a mix of (Anatoly) Karpov and (Bobby) Fischer, so potent." Carlsen's father revealed that Magnus was grateful for the support he has received in Chennai. "Carlsen is aware of the local support. He is thankful for it," said Mr Henrik.